I never wanted to be a writer. Never liked writing essays. Opted for the minor in Humanities instead of a double major because I did not want to write the thesis. Never even really like telling stories. I have always felt like they are boring and my listeners are equally as bored. I did not begin this blog to improve my writing skills or to be "discovered" or anything like that. 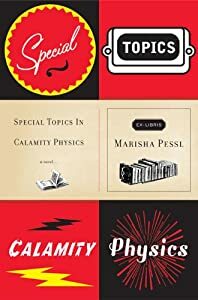 I don't know if it is just timing, because I have been so into writing these blogs, or what, but Special Topics in Calamity Physics by Marisha Pessl has made me wish I was a beautiful storyteller. This book is beautifully written. Actually, I think it is amazing. The story is good, but the writing really is what sets it apart. I feel this way about Joyce's Finnigan's Wake (although, admittedly, I have never read it.) Finnigan's Wake is a simple story. It is a good story, but simple enough. What is amazing about that book is the writing. That is the way it is with this one. Let me give you an example so you know what I am talking about. The lot was empty, with the exception of a swayback blue Pontiac parked in front of the cabin (a wooden sign slapped crookedly over the door like a Band-Aid: MAIN) and a rusty towable trailer ("Lonesome Dreams") chucked under an evangelist oak tree. (It was in the midst of some violent enlightenment, branches stretched heavenward as if to grab hold of His feet.) A white sky ironed, starched, folded itself primly behind the rolling mountains. Garbage floated across the lot, cryptic messages in bottles: Santa Fe Ranch Lay's potato chips, Thomas' English Muffins, a frayed purple ribbon. Sometime in the last week or so, it had sleeted cigarette butts. The two visuals I like most in the preceding paragraph is the tree and the cigarette butts. I don't know about any of you, but I know I would never had thought to describe these ordinary sights in such an avant-garde manner. The other major point of note is that everything is cited with a literary reference. The title of each chapter is a novel. Whenever she quotes, which is often, she uses an inline parenthetical reference. Some, I am sure, are fictitious, but others, I know, are not. It is immensely impressive. I wonder if Marisha Pessl actually read all of these books that she references. I like to think that I have read a lot of the classics, but I seriously pale in comparison. I wish I understood all of the references. It makes you want to run right out to the library and read them all. This book was billed as a coming of age story and I love me a coming of age story (see Catcher in the Rye, Salinger, 1951), but that is not how I would classify it at all. I would put it with the mysteries (Doyle, Christie). I am glad, though, that I did not know it was a mystery because I would have passed right over it. This is more than the run of the mill whodunit. It is not a straight forward Professor Plum killed Mr. Boddy in the Study with the Rope. In this book, you not only wonder who the murderer is, but who was murdered. Every time the main character, Blue, comes close to an answer, it unearths ten more questions. Just when you think you know which direction the book is heading, you turn the page and they spin you right round, baby, right round. It is a great book. I would recommend it to fans of coming of age books, mysteries, and classical literature. And be sure to take notes - there is a test at the end!